The Walker Timepiece from Barbour's main line collection is inspired in design by soft Italian leather driving gloves in brown oil hues. This element is reflected in the texture of the strap which provides an intriguing stylistic edge to this piece. The Walker has a date window at 3 o'clock and an arabic dial for added functionality. 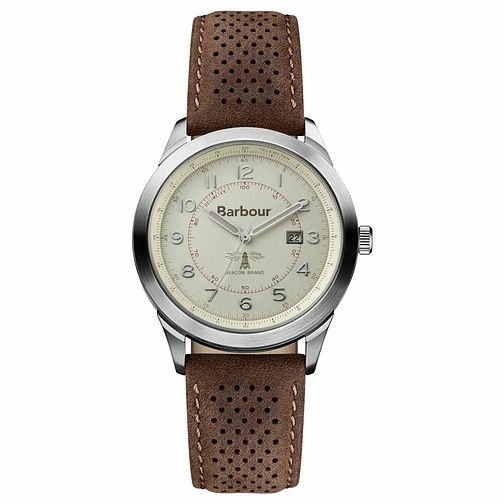 Barbour Walker Men's Walker Stainless Steel Strap Watch is rated 4.0 out of 5 by 1. Rated 4 out of 5 by Anonymous from Beautiful watch for men Lovely watch - bought as gift and the recipient thought it was great.